President Trump’s latest remarks on North Korean leader Kim Jong Un, quite at variance with previous, less complimentary nicknames such as “bad dude,” have caused confusion among America’s allies, including in Seoul and Tokyo. The idiomatic phrase which the American president used in remarks to CBS, that Kim Jong Un is “a smart cookie,” had some foreign officials scrambling for dictionaries. This all has caused an impression of some degree of confusion in the White House, and by our President himself, as to who North Korean Kim Jong Un is and what he and his family represents. President Trump then told Bloomberg News on May 1st that he would be “honored” to meet the North Korean leader. Lead a country forward? If anything, North Korea appears to be going backward, increasingly distanced from its prosperous and peaceful neighbors, a black abyss at night compared to the bright lights of South Korea. To get a better picture, perhaps some evening Mr. Spicer may wish to take a stroll past the Lincoln Memorial. There he would be able to see the distant figures of a platoon crossing in the twilight shadows and could read the words: “Our nation honors her sons and daughters who answered the call to defend a country they never knew and a people they never met.” There, at the Korean War Veterans Memorial he could read the figures: “Dead — United States: 54,246, United Nations: 628,833...” Killed by who? The invading forces of Kim Jong Un’s own grandfather. There is an old expression that the apple doesn’t fall far from the tree. Like grandfather, like father, like father, like son. Grandfather Kim Il Sung oversaw the seizure of the reconnaissance ship the USS Pueblo in international waters in 1968, killing one crew member and holding the rest prisoner for almost a year. That ship is still in North Korea. Just a year later, a North Korean fighter jet shot down a U.S. reconnaissance plane flying off the coast of Japan, killing the entire crew of 31. This was the largest single such loss of a U.S. crew during the entire Cold War era. Then in 1976, two U.S. Army officers were brutally murdered with axes in the DMZ. Kim Jong Un’s dad acted similarly. In 2010 he oversaw the torpedoing of a South Korean naval vessel, resulting in the deaths of 46 seamen. Later that same year a South Korean island was shelled, resulting in two dead South Korean marines and two civilians. There is also the current case of the four American citizens being detained in North Korean prisons. When I was in the U.S. diplomatic corps, it was standard doctrine that protection of the welfare of U.S. citizens overseas was the highest priority of the U.S. government. The case of the UVA student Otto Warmbier seems particularly tragic and worthy of White House attention. 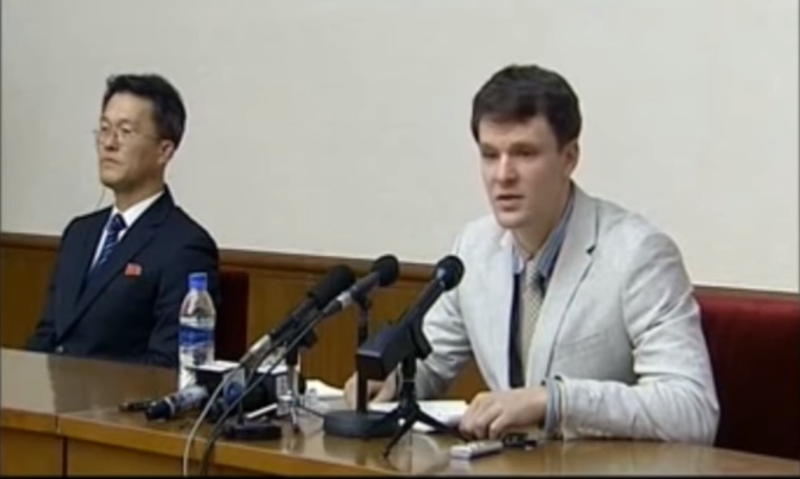 Warmbier was sentenced to 15 years of hard labor last year for reportedly pulling a North Korean propaganda banner as a souvenir off of a wall in a Pyongyang hotel during an ill-advised tourist trip. How many of us have done similar foolish pranks in our youth? The 1936 Berlin Olympian and World War II POW hero Louis Zamperini recorded in his memoir “Unbroken” how he similarly tried to steal a Nazi flag as a souvenir from the Reich Chancery. A uniformed Nazi chased him with a gun but then recognized a youthful prank and ended up letting him go. The Nazis relented where the North Koreans would not. 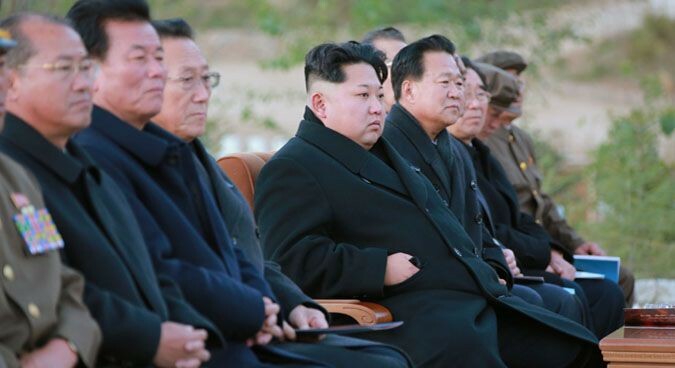 Kim Jong Un’s father also oversaw the Great North Korean Famine of the 1990s, at a time when Pyongyang was spending most available funds on the ardent and, due to the Agreed Framework, surreptitious pursuit of nuclear weapons. North Korea then appeared as a true disciple of Soviet dictator Josef Stalin, who oversaw a similar famine in the Ukraine. Washington Post columnist Leonard Lyons recorded in 1947 that Stalin, in speaking of the massive hunger, had famously said: “if only one man dies of hunger, that is a tragedy. If millions die, that’s only statistics.” For North Korea, those statistics added up to as many as two million dead of mass starvation. The tragedy of one man’s death, in this case due to a North Korean terrorist attack, came home to me just the other day. In cleaning out a bookshelf I found a copy of the book “The Korean Political Tradition and Law” by Hahm Pyong-choon. Hahm had personally autographed his book for me, then a lowly Peace Corps volunteer, at a book launch event at the Royal Asiatic Society in Seoul in 1971. A Harvard Law School graduate, who was dubbed by the Harvard Crimson in the 1970’s as “the Korean Kissinger,” Hahm went on to be South Korea’s Ambassador to the United States and an adviser to presidents. He then tragically died, along with 20 others, in the Rangoon bombing of October 9, 1983, which was masterminded by Kim Jong Un’s father. The Burmese police connected the bombing to three North Korean agents, just as the Malaysian police have more recently connected the grisly murder of Kim Jong Un’s half-brother with a chemical weapon to North Korean agents. History repeats itself. And any lingering doubts concerning the unprecedented human rights violations of Kim Jong Un’s regime were erased when the UN Commission of Inquiry on Human Rights in the Democratic People’s Republic of Korea (DPRK) released its report in February 2014. 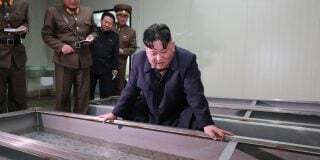 The Commission’s citing of “the highest level of the state” as having responsibility for these crimes against humanity puts responsibility squarely at the feet of Kim Jong Un, who has been the supreme leader of North Korea since 2011. Not exactly the actions of an “honorable” person. Therefore, rather than citing Kim Jong Un as someone “leading his country forward,” the White House might consider instead a Presidential visit to the DMZ, following the visit of Vice President Pence. 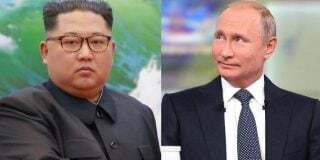 There, President Donald Trump could walk in the footsteps of the great Cold War Presidents John Kennedy and Ronald Reagan who visited the free city of West Berlin in similar periods of great peril and also under the shadow of a nuclear threat. And if the DMZ were suddenly opened, as the Berlin Wall was in 1989, there is little doubt in which direction the vast majority of people would go: they would head toward the bright lights of Seoul, leaving the sinister darkness of North Korea behind. Subscribe to read the remaining 1346 words of this article.